Take my spring home tour for simple decor ideas that will freshen your home and welcome the season. Features fresh flowers and easy farmhouse touches. Welcome to the final installment of Seasonal Simplicity! We are ending this series with beautiful inspiration and lovely ideas. 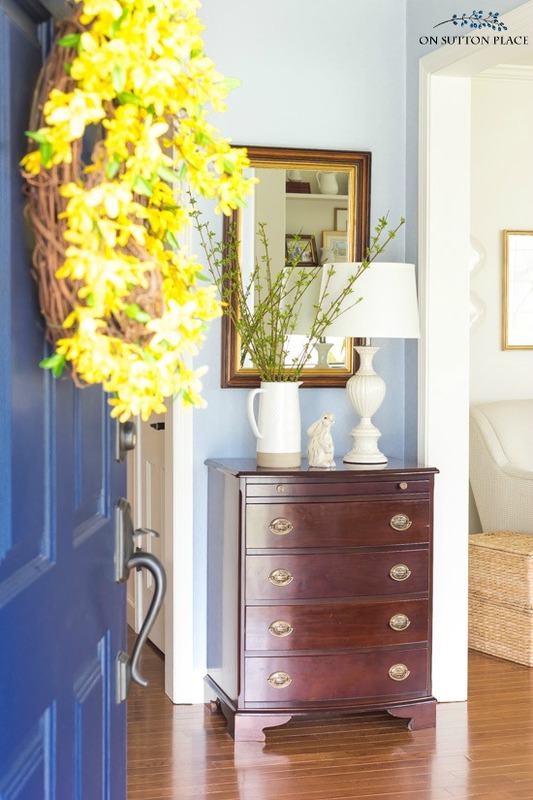 Each blogger who participated in any of the previous hops is sharing a spring home tour. All the links are at the end of the post, so please check that out when you get there. 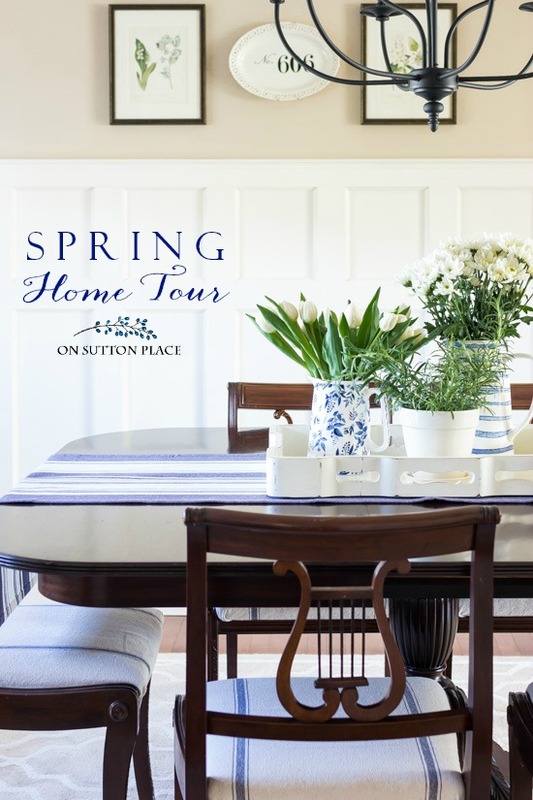 Before we begin my spring home tour, a very warm welcome to anyone who is coming over from Laura’s blog, Willow Street Interiors. 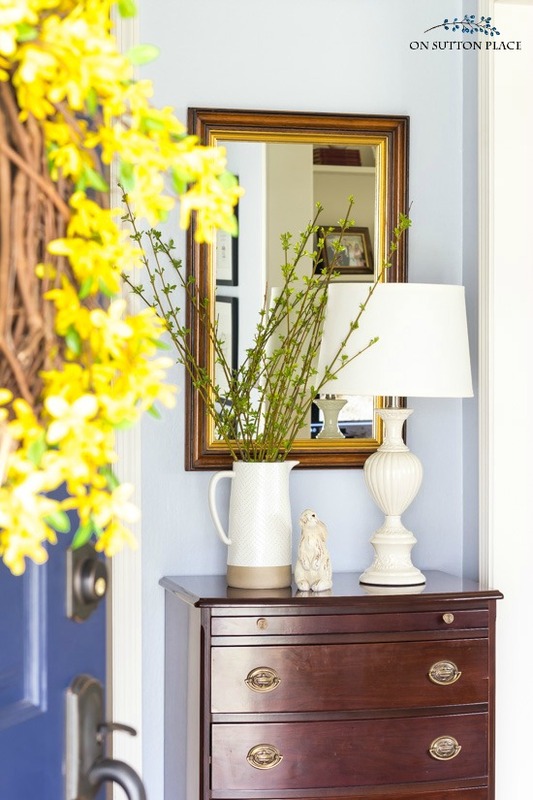 When I had to finally admit that there would be no forsythia blooms for this spring home tour, I almost bought more flowers to use in the entry. I seriously considered it for about a day, but I decided to keep it real and opted to use what I had. 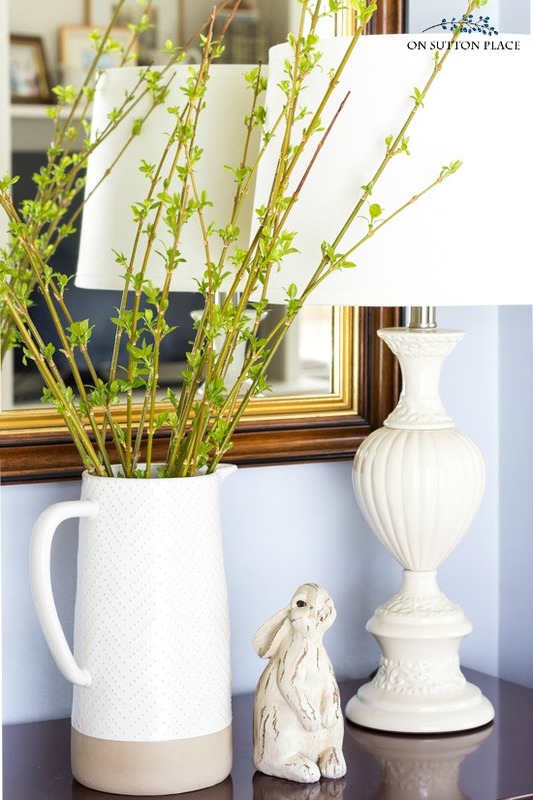 This tour is about simple spring touches that are budget-friendly and that don’t take much time. Another trip to the grocery store to get more flowers would have been silly. So the forsythia branches with tiny green leaves won out in the end. The living room has a few changes to refresh it from the winter. One of my favorite tricks is to simply move accessories around to give things a new look. I added a lidded basket to the chest to bring in some texture. I looked through my pillow cover stash and found a few old friends. I went with all blue and white for a crisp, bright look. I added buckets of faux lavender to one of the baskets on the blanket ladder. The built-in shelves were already simple and neutral, so I just removed the lanterns and added more ironstone. You can see what the lanterns looked like HERE. For a little more texture, I switched the wood tray on the coffee table with the Water Hyacinth Tray that matches the lidded basket on the chest. A galvanized lantern filled with eggs, and two new vases filled with tulips finished the coffee table. 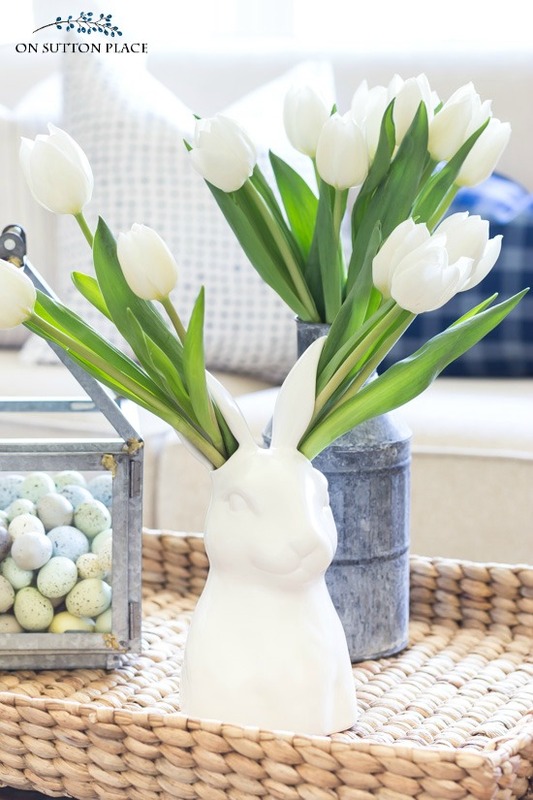 The cute bunny vase was a birthday present from my daughter and the galvanized milk can was a purchase from my Magnolia Market trip. Even though we don’t use our dining room as much as we should, I still enjoy it every day. The image below is the view from my kitchen, so when I make the extra effort to do something special on the table, I can see it from the living room AND the kitchen. Double pleasure for sure. **All pillows and quilts are from my personal collection and are no longer available. 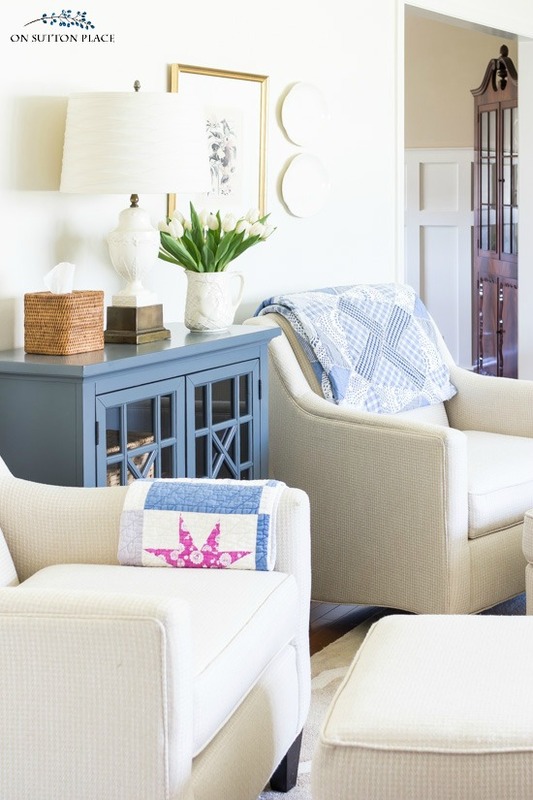 Safavieh Rug | Chair fabric | Chandelier | Botanical prints | Address decal on plate | Table runner | Blue striped pitcher | Blue floral pitcher (similar) | Ivory wood tray (similar) | Lantern hooks | Lanterns | Board and Batten details | Wall color above board and batten: Sherwin Williams Linwood Sands. 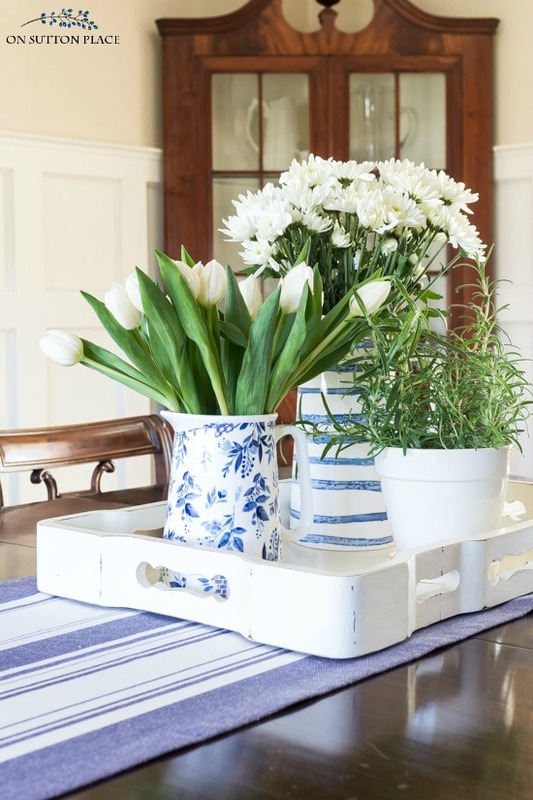 Love, love, love your spring blue & white theme! I tend to save that look for summer, but why wait! Great decorating tips! I’ve been considering adding plates as part of the wall decor and now I’m sold. I’m inspired by mixing them with framed pieces of art; even the white plates on white walls works by adding dimension & texture without taking up visual space. And in regard to the forsythia, I noticed it immediately in your first photo & thought it was a beautiful green touch for early spring. So glad you kept the branches as is. 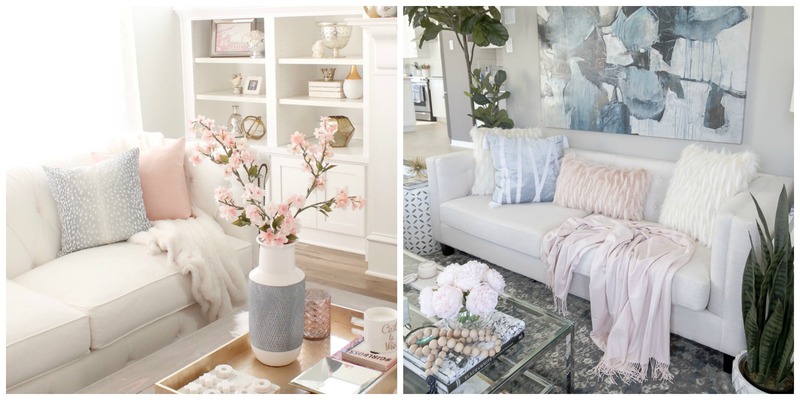 It’s still cold here in PA, but I’m so ready to start my spring decorating…today! Your home is just beautiful Ann! Thank you so much for your lovely posts each week. I always look forward to your blog, beautiful artwork and decoration ideas. Thank you! 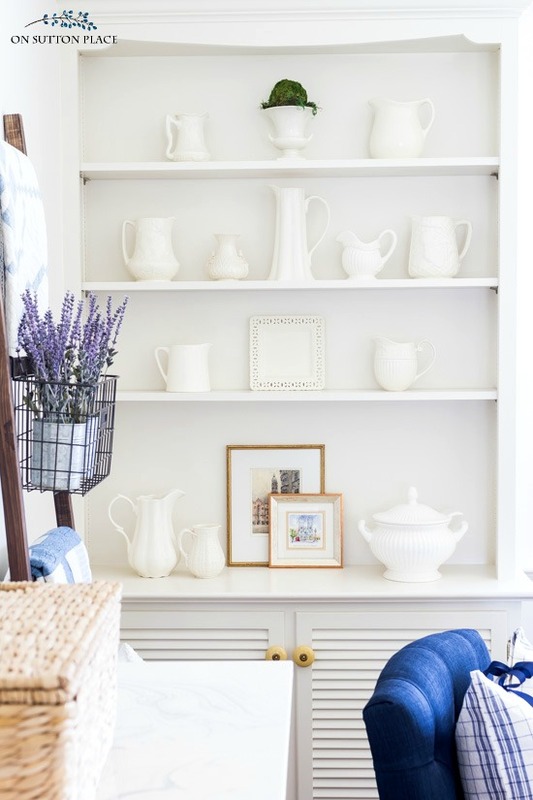 Hi, I love all the different textures you used in your home, and anytime I see white with navy, it’s worth a click to me! I completely agree about moving accessories around. It’s a quick trick that can change the mood of the room, usually to brighten it up, and your home looks extra inviting and cheerful. I love those extra plush looking pillows on your sofa, too. Your home is so beautiful! I love your ironstone collection! Your style is so timeless and chic. Thank you for sharing! 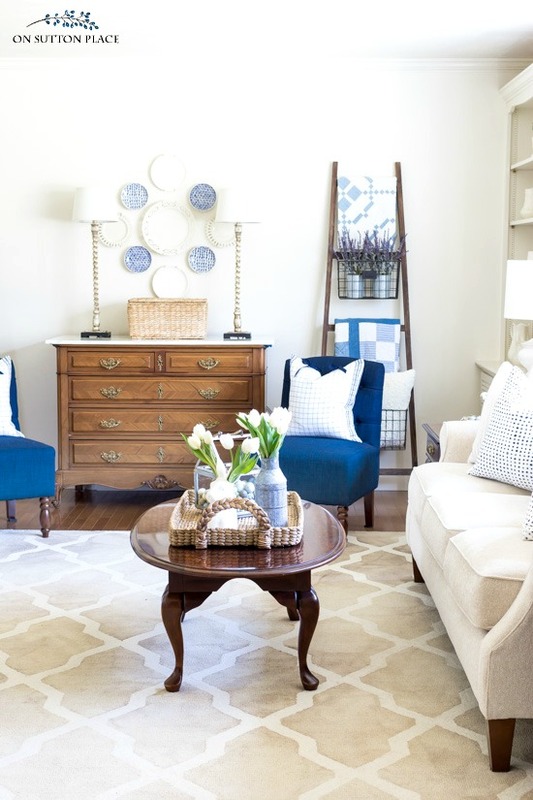 I love how you mix the traditional case goods (furniture) with current neutrals and refreshing shades of blue. Truly lovely. LOVED the spring home tour; thanx for the inspiration! 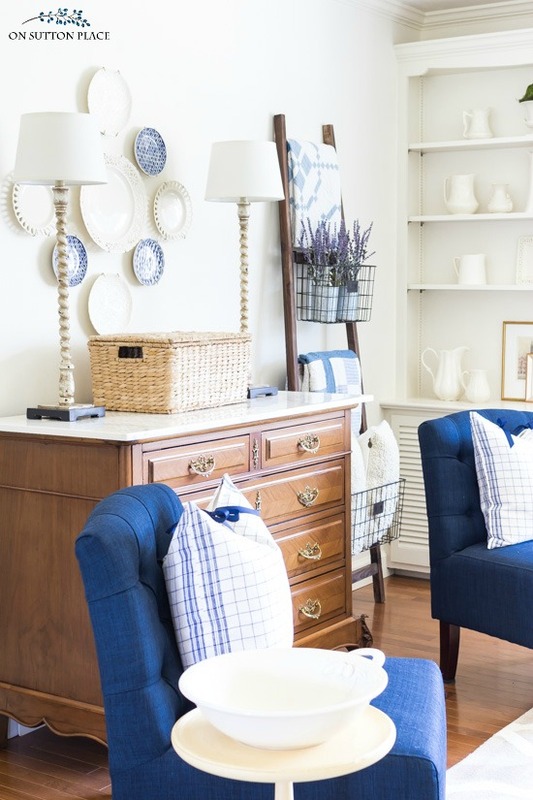 Ann, I love everything about your house, especially the blue and white accents. Just beautiful. Hi, there! What a lovely post! Your Dining Room is great! 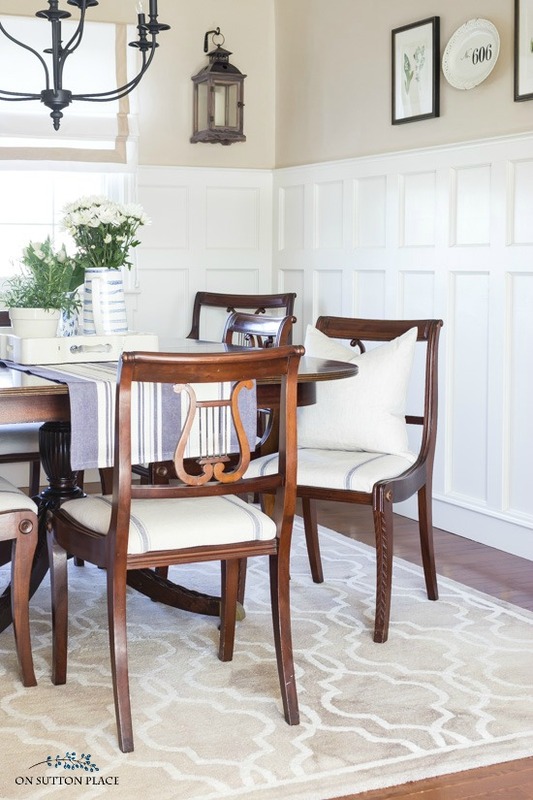 Love the wainscoting and the dining room set. All your Spring touches are charming. I can only imagine your impatience until those branches bloom! Thank you for inviting us for a peek! Your home is beautiful, Ann! I love your herb garden and pops of green and blue throughout. Thank you for inviting us to your beautiful home. It’s colorful and crisp and I love it. Anne, your home is beautiful. 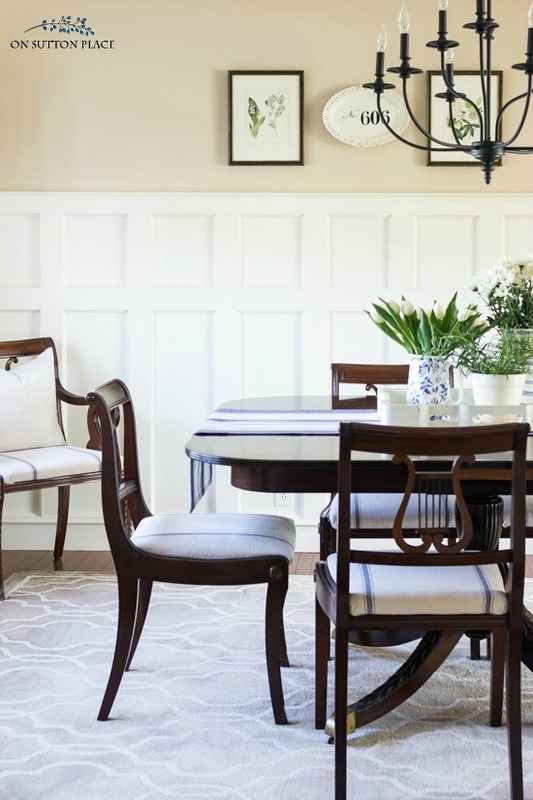 I still sigh when your dining room is featured, that wainscoting…so lovely – classic, yet fresh. Love your quilts shown folded over the chairs. Thanks for sharing!! Beautiful spring tour, Ann! I love the crisp blue and white and fresh branches. So glad you could be part of this tour series!! Ann, I love your clean style of decorating. Your dining table and chairs just beautiful. This is why I welcome your blog. Love the blue and white. I tend to gravitate to the blues. 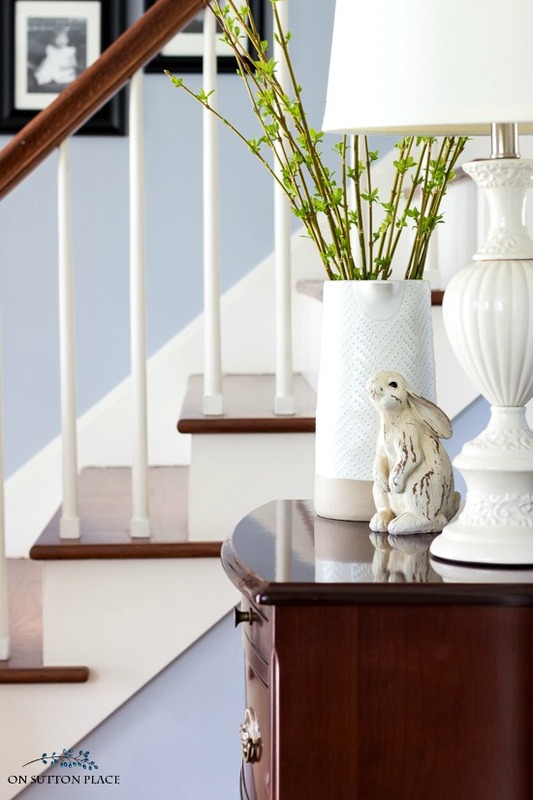 I like the little bunny in your entryway. Everything looks great! Your home is gorgeous! It is so welcoming and serene. Thank you for the links to some of the items you have. Now it’s time for me to shop! Ann,it is so refreshing to see a home with some color rather than all the bleached furniture. The warm wood says come in and stay a while. Love your blog. Love the fresh look for spring. 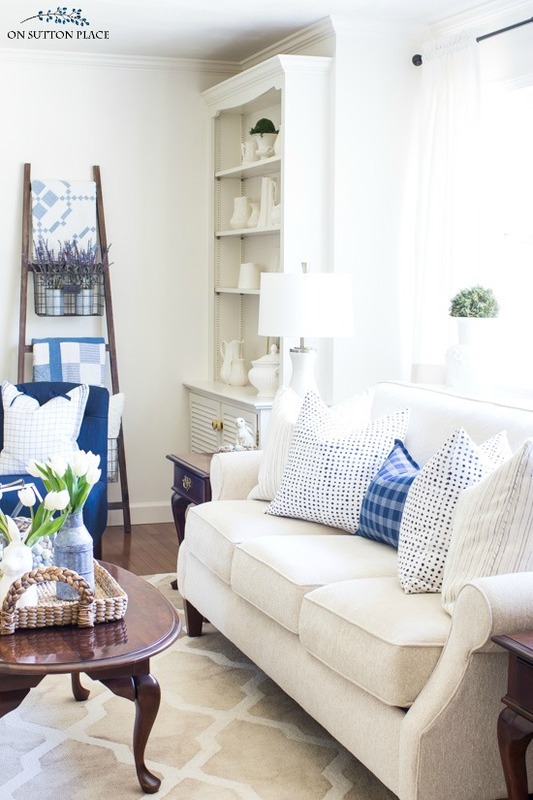 I love love love the white fabric with the blue dots on the pillows on your sofa. So clean and fresh. Did you make them with fabric yardage? Hi Diane! Those pillow covers are from IKEA and I got them several years ago. They have been inside, outside and washed several times. They still look like new! Thanks for the tour! I love the simple hint to move things around to give a new look! Thank you for your wonderful blog. Ann, Can you tell me where you got the tissue holder shown in your living room?! I love your home and your blog! Hi Linda…that came from Crate and Barrel. I added the link to the source list. Thank you! 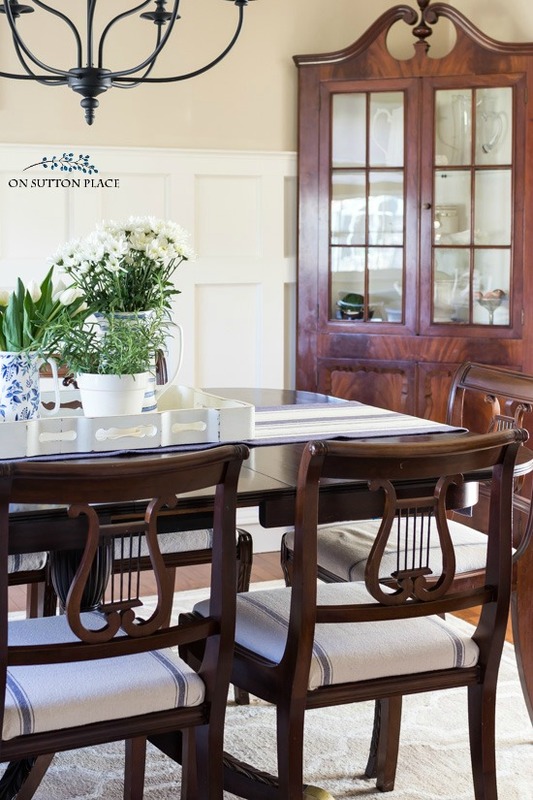 Just love the Spring look – gave me the incentive I needed to change the dining room table that gets overlooked with every passing. Must ask – do you do the watercolors. They are absolutely delightful. Hi Carol…yes the watercolor printables are original and I design them myself. Most of them are made from my own photographs that have been digitally transformed into watercolors. Thanks for taking a look! Very nicely done. I would have add a little blue pillow to the side chair in the dining room. Love all your ideas. I love it! Great taste.